After a two-vehicle collision a man had to be cut out of his car on High Street in Lye. West Midlands Fire and Rescue and paramedics were called to the scene on High Street Lye. 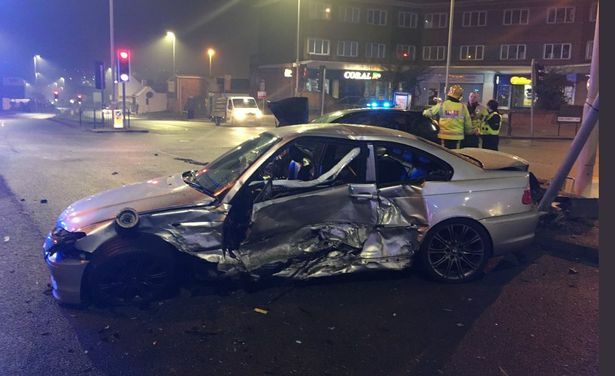 West Midlands Fire and Rescue and paramedics were called to the scene after two cars, including a BMW, were tangled in the crash. Firefighters had to use Holmatro cutting equipment to help remove one man from the car. He is understood to be suffering from lower back pain. The service revealed on Twitter that he “received first aid and precautionary checks” by ambulance staff. The fire service Tweeted: “Considering the damage, could have been a lot worse. The driver of one car was assessed and treated at the scene by ambulance staff before being taken to Russells Hall Hospital.